Location is often considered the determining factor in real estate value, but commercial property sales can’t move forward without evaluating the environmental conditions. Indiana environmental company EnviroForensics recently conducted a vapor intrusion investigation on a two-story building in Indianapolis that is now cleared for sale based on a clean bill of health designated by the Indiana Department of Environmental Management. I’ve owned the building for 20 years, and we were confident that we were not contaminating the ground, but we needed proof. EnviroForensics provided that proof so that IDEM is allowing us to go ahead. During the sale of a building or piece of property, location plays a key role in real estate value, however property owners are often surprised to find that commercial property sales can’t move forward without evaluating the environmental conditions. 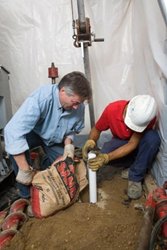 Indiana environmental company EnviroForensics works with property owners throughout the country to assess and test for vapor intrusion, a definite roadblock to the progress of a sale. Most recently, EnviroForensics and Indianapolis property owner Stephen Waugh celebrated the closure of a vapor intrusion investigation conducted on Waugh’s older (the original building dates back to the 1930’s, with additions into the 80’s), two-story building. After extensive testing and based on a clean bill of health from the Indiana Department of Environmental Management, the property is now cleared for sale with no further action required in terms of environmental regulatory compliance. The two-story building at 1234 North Capitol Avenue in Indianapolis contains two businesses and four apartments. It is now listed for sale after environmental monitoring allowed the Indiana Department of Environmental Management (IDEM) to give the structure and adjacent parking lot a clean bill of health. The 12th & Capitol building (actually one-half block north of 12th on the west side of Capitol) is located just north of downtown. The surrounding area is experiencing a surge of development; old nearby apartments and light industrial buildings are being renovated and new medical facilities are attached or adjacent to IU Methodist Hospital nearby. EnviroForensics, Inc. of Indianapolis managed the environmental testing program. The Indiana environmental engineers installed wells on and adjacent to the property and monitored the groundwater looking for traces of an old dry cleaning solvent used decades ago by a former business at the site. Upon reviewing the facts, IDEM determined that no further action is needed. IDEM notified property owner Stephen Waugh that the property could be placed on the market. The best part for Waugh, aside from the clearance to sell, was that the environmental checkup cost him nothing. EnviroForensics secured $5 million in coverage from old insurance policies written by four different companies. Just $400,000 paid for the monitoring. The balance is still available, if it is ever needed. The building now listed for sale is leased for the next five years. Harvest Moon hydroponics and the American Red Cross are on the ground floor. Four apartments are above. For more information on this story, call 866-888-7911. EnviroForensics’ engineers and scientists offer leadership and international experience in site investigation, pollution remediation and removal, resource management and legal support. The company specializes in remediating soil and groundwater contamination caused by chlorinated solvents used by dry cleaners and manufacturers. EnviroForensics is currently managing major pollution abatement projects in Indiana, Wisconsin, California, and the State of Washington. Reach EnviroForensics at http://www.enviroforensics.com, (317) 972-7870.